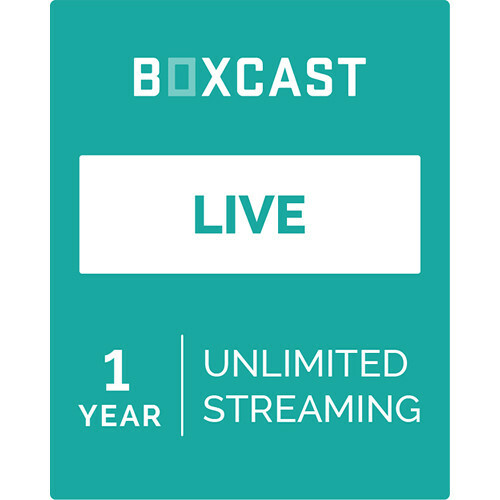 The BoxCast Live 1-Year Subscription is an ad-free live streaming service plan for the BoxCast streaming platform. BoxCast Live is ideal for broadcasters looking to extend their reach by simulcasting their video to multiple social media destinations, such as Facebook Live or YouTube. BoxCast Live allows up to 720p resolution streaming at 2 Mb/s and unlimited viewership, and it includes email support 7 days a week. Either the BoxCaster Encoder or RTMP Encoder Activation, both sold separately, is required to be paired with BoxCast Live to be able to use the service plan. BoxCast Live is seamlessly compatible with the BoxCaster Encoder. The BoxCast platform provides a fully end-to-end workflow, from acquisition to compression, cloud transcoding, archiving, video on demand, pay-per-view settings, and scalable delivery. Note: Optional BoxCaster Encoder or RTMP Encoder Activation is required to use BoxCast Live. The BoxCast Live plan works seamlessly with the BoxCaster Encoder to livestream your events. The BoxCaster Encoder or RTMP Encoder Activation is required to be purchased separately with BoxCast Live. Stream as many events as you want to as many viewers as possible. The BoxCast platform easily scales with your organization and doesn't set limits on viewership quantity. Stream your event to various RTMP destinations, including Facebook Live, YouTube, Periscope, and Twitch. BoxCast Live users have access to BoxCast specialist support by email 7 days a week from 9AM to 9PM (from 7AM on Sundays). Upon purchase of a BoxCast streaming plan and a BoxCaster Encoder or RTMP Encoder Activation, an activation code will be emailed to you. Follow the instructions in the email to create your BoxCast account and start streaming.